Abi Borojevich of Evergreen drives to the basket in a game against Eastwood Friday. The Vikings would fall to the Eagles by 18. Savannah VanOstrand of Evergreen (with ball) looks to make a play during Friday’s game. Evergreen played highly touted Eastwood nose-to-nose for 25 minutes. But five straight turnovers turned into an 11-0 Eagles run in a two minute 45 second span in the fourth quarter, and the Eagles went on to a 62-44 win. “First of all I want to give credit to Eastwood,” Viking coach Brittaney Cymbolin said. “Jamie Schmeltz is a great player and they had a couple other kids hit key shots at the right time and then there were the times we didn’t take care of the basketball very well. Schmeltz, the Eagles’ 5’10” junior guard who is a Division I recruit, scored five straight early to give Eastwood a 5-2 lead with 5:32 left in the first. However, the Vikings responded as Kelsie Komisarek drilled a triple from right side to tie the game, Savannah VanOstrand scored on a power move inside and Mady Peluso scored in transition to put Evergreen up 9-5. Aubrey Haas’ three-ball knotted the score at 11-11 with 1:25 left before Nicole Brand’s three-point play off an offensive rebound again put the Vikes ahead. That lead was short lived as McKenna Souder stuck a triple with 15 ticks left in the quarter to bring the Eagles even, 14-14. A Schmeltz three-pointer opening the second and basket off the offensive glass spurred an 8-0 burst to give the Eagles a 22-14 advantage with 5:43 left in the half but Kennedi Keifer brought Evergreen back. The junior guard hit a right wing jumper to get the Vikings within 24-20, then scored twice off a fast break then a steal to get Evergreen into a 26-26 tie with 1:09 left in the half. Schmeltz gave Eastwood a 28-26 lead at the break with a putback with 48 seconds left. It was Schmeltz again with two more hoops to start the second half, putting the Eagles up six, but again the Vikes answered, this time when Abi Borojevich hit three straight from the line and scored on an up and under move inside. Schmeltz and Hannah Owens combined to score eight more Eagle points but VanOstrand’s triple from the top of the key and Borojevich’s left-hand spin kept Evergreen close at 42-36 heading into the fourth. 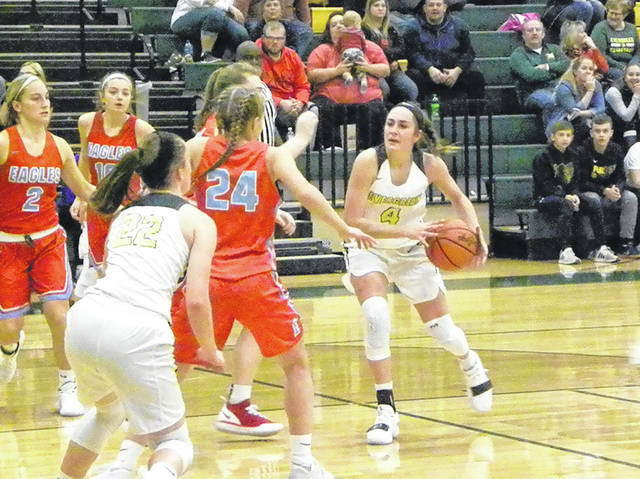 Borojevich knocked down two more from the line to get Evergreen closer at 42-38 a minute into the final quarter, but the turnovers that hindered the Vikings the entire game finally took a toll. 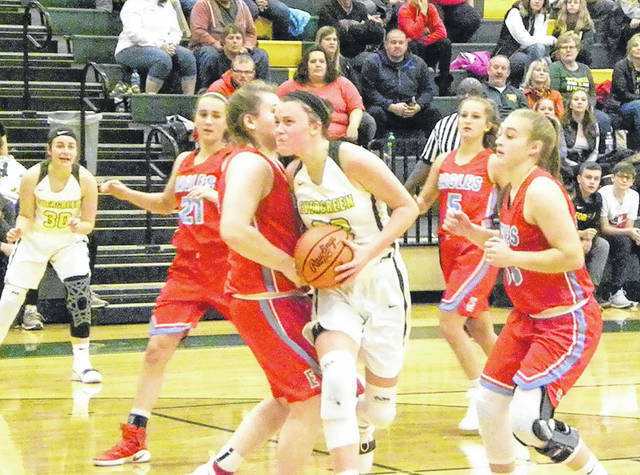 Schmeltz took advantage by knocking down three buckets, Owens another and Jaylee Souder chucked in a long three to give Eastwood a 53-38 lead with 5:15 left. This time Evergreen did not have an answer as the Eagles forced 23 second half turnovers and 34 for the game. Evergreen harassed the Eagles into 23 miscues but the Vikings got off only 38 shots on the night, hitting 15. The large number of turnovers allowed Evergreen only 12 second half shots which they made five. Schmeltz was the only Eagle in double figures with a whopping 34 points. Borojevich was the only Viking to hit doubles with 13. Evergreen travels to Otsego tomorrow before returning home next Tuesday against Jones Academy.